Check the fluid pressure as follows to determine whether the trouble is in the pump or steering gearbox. 1. Check the power steering fluid level (see page 17-28). 2. 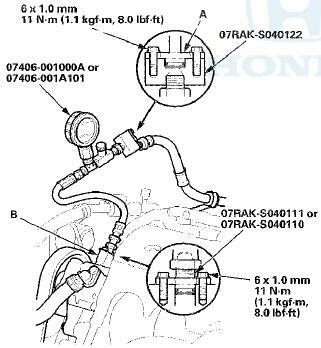 Disconnect the pump outlet hose (A) from the pump outlet with care so as not t o spill the power steering fluid on the frame and other parts, then install the pump joint adapter o r P/S joint adapter (pump) o n the pump outlet (B). 3. Connect the hose joint adapter to the P/S pressure gauge, then connect the pump outlet hose to the hose joint adapter. 4. Install the P/S pressure gauge to the pump joint adapter or P/S joint adapter (pump). 5. Fully open the shut-off valve (A). 6. Start the engine, and let it idle. 7. Turn the steering wheel from lock to lock several times to warm the fluid to operating temperature at 158 В°F (70 В°C). 8. Measure steady-state fluid pressure while the engine is idling. If the pump is in good condition, the gauge . should read no more than 1,470 kPa (15 kgf/cm2, 213 psi). If the reading is high, check for: -Clogged or deformed iniet or return line between the pump and the steering gearbox. 9. Let the engine idle, and gradually close the shut-off valve and immediately read the pressure. Do not keep the shut-off valve closed more than 5 seconds or the pump could be damaged by over-heating. 10. Immediately open the shut-off valve fully. If the pump is in good condition, the gauge should read at least 8,140-8,830 kPa (83-90 kgf/cm2, 1,180 вЂ” 1,280 psi). A low reading means the pump output is too low for full assist. Repair or replace the pump.